Thanks for your opinion! I too think it strongly depends on the horse how reward is delivered most effectively. As you wrote Jackie, my project horse is absolutely the "whatever type" while another one (a frisian) is crazy about being rewarded verbally. What I wanted to point out is that we sometimes reward in situations where reward is not helpful. But of course, we need reward in general to help the horse understand. It's an interesting twist to assume that we reward the horse not for obedience but for the mental process of figuring something out. I'll try to wrap my brain around it. I think it depends on the horse. Havoc's mother is a very dominant mare, she is submissive ONLY to my mother, who must reinforce it on a regular basis. However, she was also clicker trained when she was young. To this day, give her a cube of sugar and she'll ask what she needs to do to get another! She will twist herself inside out to figure out what will get her the reward. Havoc, my little darling, also is a happy food motivated child. He now gets the odd sugar reward when he's being ridden, to reinforce the good, and, to some degree, keep him focused on figuring out what he needs to do to get the NEXT one. The sugar is paired with the verbal reward. Verbal reward becomes the bridge for him. However, Miss Mo, a dominant, excessively hot horse in her own right... she is dealt with differently. When she's relaxed and thinking and working with me, I can praise her and it's received as such. When she's frantic, freaking out and just plain nutso, it's completely irrelevant, probably doesn't even reach her brain. Much like horse number 1. I'm sure if Havoc's brain went to mush, he'd be the same, but, touch wood, it doesn't. He's been raised as a very people focused horse, he is not hot, and he does want to please. Mo, well, she's going to be a trail horse, her brain is not conducive to being a dressage horse (for the record, what stresses her out is the collected work, can't take it, she's quite at ease out and about). I discovered a partial solution to my problem of wanting to praise the horse. This is based on knowledge I got on the internet from horsemen who ride/train Western horses. When I train a horse to an aid, I give the aid, I release the aid. If the horse does not give me the response I want I apply the aid again at the proper point of the horse's stride. If the horse obeys I just sit there, passive, while I count to 10. Then I praise the horse, not for obeying my aid, but for being smart enough to figure out what my aid meant. I make really sure not to reward disobedience. But, if after applying the aid three times and the horse does not obey, either the horse is hurting somewhere or the fault lies with ME. I move onto something I think the horse will obey willingly, release, and move on. With this method I still get to praise the horse. 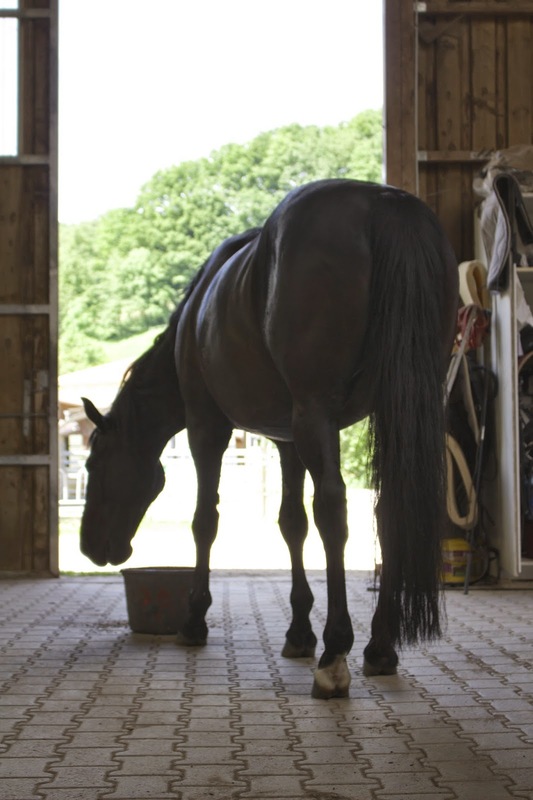 It is based on the hypothesis that it usually takes a horse around 4 seconds to mentally process the aid-release. If the horse thinks in any way it is getting rewarded when I praise, it is being rewarded for using its brain to understand what just happened, since that will be the most recent "activity" of the horse. By using this method I find I can cut the time I use to train a new aid down by two-thirds. By the third time the horse usually gets it, and if the horse does not "get it", well, its my fault, I'm doing something wrong.